Grab that sausage and make the pants sing! 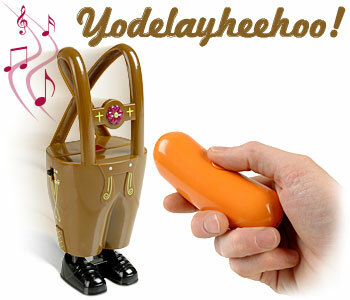 Remote-controlled, yodeling lederhosen! Just squeeze that fat, orange sausage, and a pair of disembodied pants will dance a jig and sing a merry Alpine tune. A challenge: Take one of these to your next bioethics conference, along with a copy of White Coat, Black Hat, and see which is a bigger hit. I think we both know the answer.